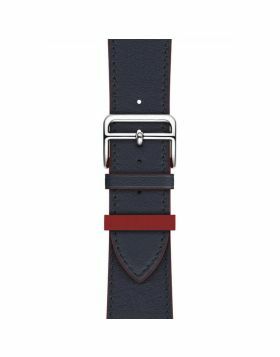 - Like a unique, luxury iwatch strap, this leather apple watch band is undoubtedly a great reference. - 100% Premium quality apple watch leather band 38mm/40mm & 42mm/44mm. 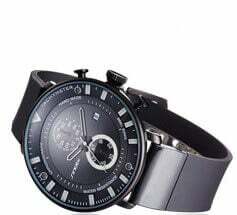 Crafted from genuine cowhide leather, new stylish design, comes with stainless steel polished silver-coloured Classic buckle, anti-slip & sweat-absorbent. Classic, stylish and durable, it perfectly matches your apple watch. 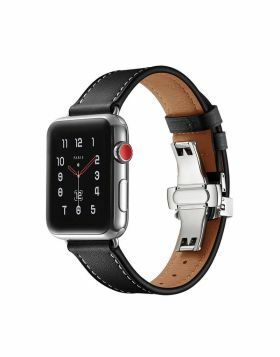 - The black leather band comes with Apple Watch Lugs on both ends, which locks onto Apple Watch Interface precisely and securely, easy to install or remove. 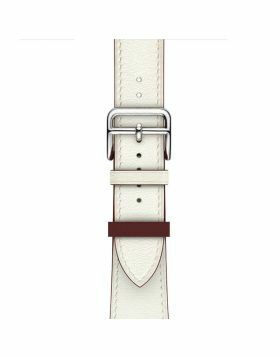 - The leather band is adjustable to find the perfect fit that is just your size and comfortable to your wrist. This is the perfect choice for your iwatch band. - Get the same quality as the original Apple Watch strap with less budget! Question:Is this apple watch band genuine leather? I worry about it is not leather and have a horrible chemical smell? Answer: It's 100% genuine leather! retro appearance personalize your exquisite Apple Watch. Question:What is the exact length of the leather band. Not including watch just band? Answer: Fits wrists from 6.45"-8.66"(165mm-220mm) in circumference. Suitable for men and women.